How Is the Appraisal Process Different for Limited Scope? Clients are increasingly asking for limited scope appraisals—that is, appraisals that require a scope of work that is less than the traditional “full” appraisal. When faced with one of these assignments, you may be uncertain as to what you’re permitted to do, and how to go about completing it in compliance with USPAP. The good news is, the overall appraisal process is essentially the same no matter what type of assignment you’re tackling. However, there are some additional considerations for limited scope appraisals—especially when it comes to deciding whether or not to accept an assignment. 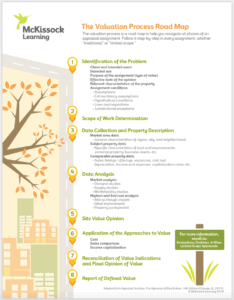 As a member of the appraisal profession, you have a clearly defined road map to help you navigate all phases of an assignment. It is called the valuation process. It works universally for all types of properties in all market areas. If you faithfully follow the valuation process step by step, and apply diligent effort, you can solve any appraisal problem. The first step in the valuation process (i.e., appraisal process) is to identify the problem. There are a number of assignment elements to identify during this phase of the assignment. First, you must identify the client and intended users of the appraisal, as well as the intended use. An appraisal is an answer to a question, so what question is the client trying to answer? The limited scope appraisal has a specific and limited intended use. Most lenders who are regularly ordering this service are doing so for a specific loan product (such as a home equity line of credit), for a second appraisal, or some are using it for portfolio or asset management. Sometimes these assignments are ordered by an entity who is not a mortgage lender, in which case you might need to ask some questions and do some digging in order to determine the intended use. Your point of contact may be a third party who does not really know what the intended user needs, they are just processing a work order. The entity who is contacting you, for example an appraisal management company (AMC) or a process manager (PM), may not know that the client intends to use the appraisal for portfolio management or to try to gauge the value of the collateral for a loan in trouble. If the assignment conditions look atypical and have restrictions like “do not contact resident,” etc., you may need to follow up with someone more knowledgeable about the specific intended use. Remember: The credibility of the appraisal assignment results is judged within the context of the intended use. So having a clear understanding of the intended use is paramount. Once you have identified the problem and know who, what, when, where and why—how do you answer the appraisal question? The second step in the appraisal process involves developing the scope of work for your limited scope assignment. Remember: Only you (the appraiser) can determine the scope of work. The client may have assignment conditions and special needs for its intended use, and hence the client may have some input into the scope of work. You need to clearly identify those assignment conditions in the problem identification phase of the assignment. For example, if a client always requires a cost approach, regardless of the age or condition of the subject property improvements, this would be an assignment condition that would need to be considered in your scope of work determination. Accept or reject the assignment? Do you have the data resources needed? Are you familiar with the market area? Are you familiar with the property type? What do you need to do to produce credible results? Does a limited scope of work limit credibility? Are you competent to perform the assignment? Are you comfortable with the assignment? Do you have the time and resources available? Will your analysis provide credible results and will your report contain sufficient information for intended users to understand it properly? Get your limited scope questions answered in our new CE course: Evaluations, Desktops, and Other Limited Scope Appraisals. Limited scope appraisal assignments require market area knowledge and a high level of familiarity with property type. Experience in appraising similar properties near the subject and additional thought and decisions are required to set the assumptions for the subject—more so than in a full scope appraisal, where the appraiser can do any necessary additional research and analysis. If you do not have the knowledge and experience to complete the assignment competently, you may want to decline. Once you have identified intended use and intended users, considered assignment conditions, know that you are familiar with the market area of the subject, possess sufficient data resources, have identified the appropriate scope of work, are comfortable with the assignment, and believe that you can complete it with credible results—you can accept the limited scope assignment and proceed with the appraisal process.